The Kisoro Trust is a charity registered in Scotland which was established to raise funds towards a school for deaf children in the Kisoro diocese of Uganda. The school first opened in 2001 with the aim of funding a single class of 15 children for two years. However thanks to our regular donors and fundraisers, the Kisoro School for Deaf Children gradually grew to 60 children in classes from Primary One through to Primary Seven. Here in Scotland, deaf children can enjoy most of the same opportunities as their hearing friends and have the potential to contribute fully to society. But in Uganda things are very different. During Idi Amin's regime (1971-1986) basic services such as health and education were allowed to deteriorate and despite the present political stability, there remained a great deal to be done. The Ugandan government is aware that education is the key to development and is implementing a policy of universal primary education, but the needs of children with disabilities such as deafness had not yet been addressed, particularly in rural areas. Without any education, these children are unlikely to be able to gain even basic language skills and face a very uncertain future. Since 2008 the school has been based at Kisoro Demonstration School, which is government aided and registered by the Ministry of Education and Sports in Uganda. A unit for children with special educational needs was established at the school as far back as 1995 so it was appropriate that the Deaf unit was to later to be accommodated within such an integrated educational environment. Including the mainsteam classes, there are a total of 696 pupils, of which 68 have special needs and 36 are currently deaf, all under the guidance of Head Teacher, Nkurikiyimana Gerald. The support for the Deaf Unit at the school is assisted by the Kisoro District Association of the Deaf (KDAD). KDAD manages the donations provided by the Kisoro Trust and ensures the children are provided for outside the classroom. 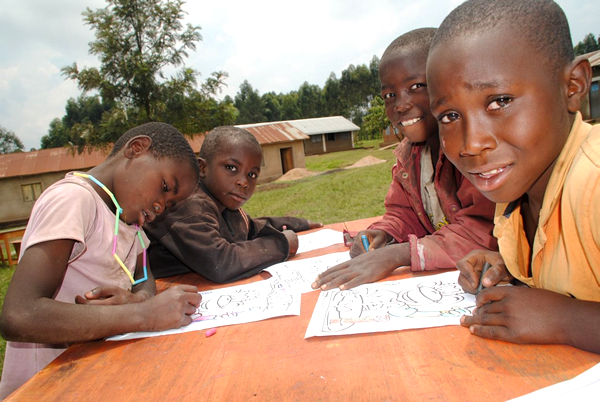 Many of the children's families live outside the town of Kisoro and so they require local accomodation and food. There is also a small contribution paid by the families themselves towards their children's education. It is very appropriate that KDAD is involed in this role, as they themselves are former pupils from the school and so as well as helping the current Deaf children, KDAD is an example of how disadvantaged children can learn and go on to play a significant role in their communities. 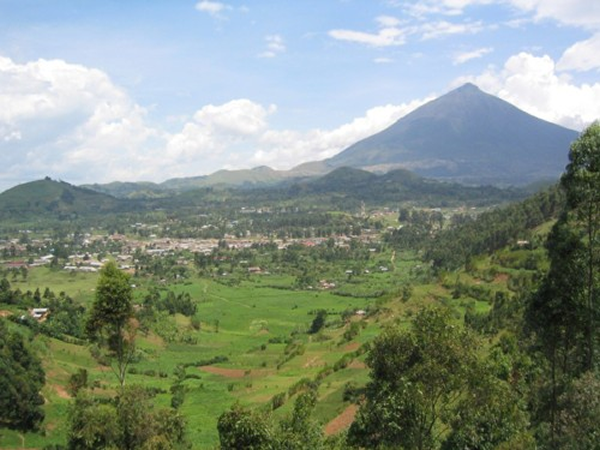 Kisoro lies in the extreme south west of Uganda, and is 96% rural. There are approximately 150 deaf and hearing impaired children of primary school age, very few of whom actually attend school. Few parents cannot afford to send children to the next nearest special school, nine hours away by bus in Kampala. View of Kisoro, with the 14000 ft Mountain Muhabura in the background. To find out where Kisoro is, check on Google Maps here.